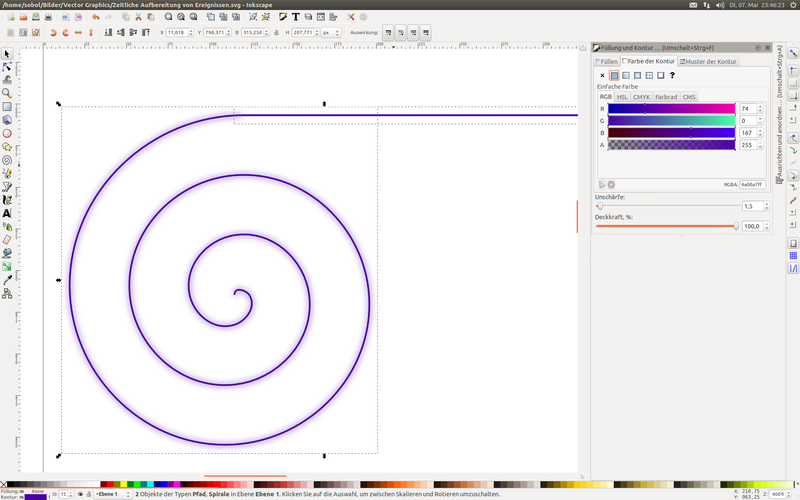 I have added a Bezier line to the outer end of a spiral. (See comment for details.) After that I selected both, colorized them and gave them a small amount of blur (1.5%). The problem is, that only the spiral gets blury, but not the Bezier line. Nevertheless, if I move one node of the Bezier line somewhere else to the outer path of the spiral, select them both and apply a blur, both get blured. I moved the node with the Edit paths by nodes tool and enabled Enable snapping -> Snap notes or handles -> Snap to paths. I would like to know, how I can blur both objects at the same time without all the effort described above, if this is not a bug. [EDIT]: After messing arround with the problem for another while I realised, that the blur of the line only disapears, if I level the two nodes of the line exactly one the same y-values with copy and paste. In my first try I entered the y-value of the left node of the line in the "y-value box" (at top) of the right line-node by hand, what probably results in not exact the same numbers as copy and paste does. In my second try to recreate the problem, I copied and pasted the y-value from the left line-node to the right line-node and as soon as I did that the blur of the line disapears. I could not find any information that this behaviour is intended by the developers. Thus I guess this is a bug and I will report it to them and write about the progress in here. Technically not a bug - a horizontal (or vertical) line has only one dimension, and the filter effects region thus too (i.e. the blur is not visible). - Combine the line with the spiral (the bounding box of the resulting paths as two dimensions), and blur the combined path. - Group the line with the spiral, and blur the group, instead of the individual objects. Not the answer you're looking for? Browse other questions tagged inkscape blur or ask your own question.